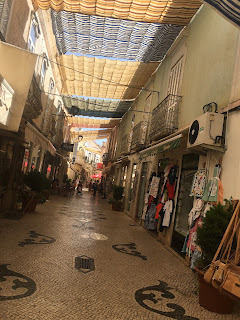 Gosh I have no idea where the time has gone - we have been hanging out in the heat of the Algarve for the last couple of weeks - 10 days in Lagos where we did a few boats jobs, provisioned and did some exploring. Lagos is a fabulous marina at the top of the canal away from the touristy town and we got a really lovely spacious quiet berth in the north part of the marina. We were able to drop in our dinghy and explore the rocks and caves out in the bay and it was really handy for the supermarket just across the road. Sadly just after we arrived our fresh water pump failed again - this is not funny any more. This was the Chinese one that went back in when our second beautiful Italian pump failed - this time we had no spare so option one was to stick a hose pipe through the window and option two was to connect the hose directly to our water supply - that worked brilliantly after a bit of tweaking but it meant we couldn't leave the dock. The new pump was on it's way to the marina as was the new air-conditioning unit so we decided to stay a while. We met lots of people who kept their boats in Lagos, including Faith & Joe who had an Oyster 46 that was ten years old and we enjoyed sharing lots of experiences with them - they said they went for the matte version as Askari did look at bit shiney in comparison.... A bit swell set in while we were there - a good day for the beach as so much entertainment. Big swell - note yacht coming in!! The second night we were in Lagos Yoshi from Crows Nest 7 messaged us to say he had arrived in the Marina - he promised us Sushi when we met in A Coruna and wondered if we fancied popping over later that night. Who could refuse homemade sushi on a Japanese yacht?? 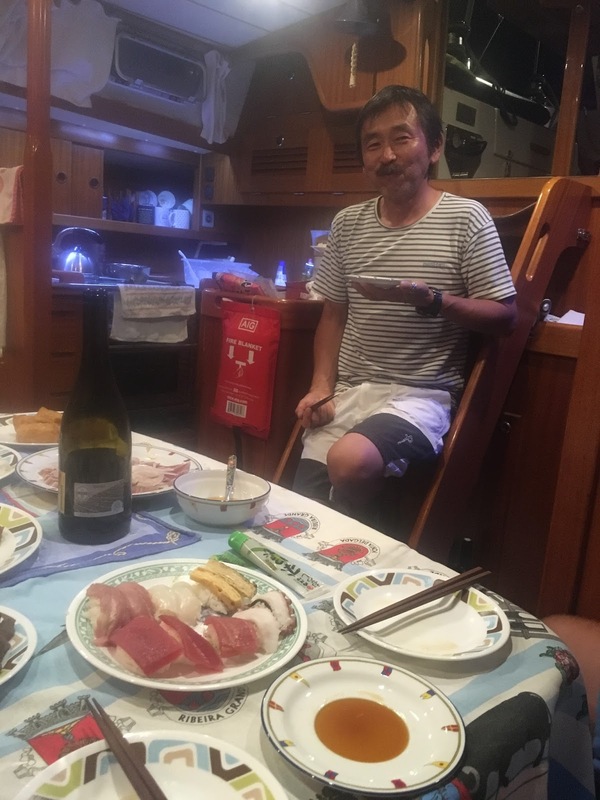 We had one of the best evenings - Yoshi had Yama and Naomi on board as his crew for the next part of the trip - Yama an retired Rocket Scientist who had worked on the Japanese Space Program, Naomi a sailing writer who currently lives in Burma. Also the fabulous McIntyre family who were Yoshi neighbours in Japan until recently who had been sailing with him for the last week. When we arrived the table was covered in food and drink and then it was a total feast of handrolls - which we made ourselves, marinated bonito that Yoshi caught the day before, nigiri with fish from Lisbon fish market, fermented beans, soup and so much more. Yama produced rice wine and we ate and drank so much while exchanging sailing and travel stories with so much laughter - fabulous people and a really treat. On a Saturday morning Lagos has a fabulous farmers market - a real one where the farmers come in to town in there three wheeler trucks with their flat caps and sell their goods next to the bus station - there is everything from fruit and veg to homemade cakes and live chickens and ducklings. Andrew's son James arrived to spend a week with us at the end of his break from college - he was ready for some relaxation but we did manage to drag him into town and to explore the cliffs at Sagres. We hired a car to collect him from Faro and took the chance to explore inland at Loule and Sao Bras de Alportel - Loule has a fabulous market and castle which we loved however the long walk in 30 degrees of heat to find the roman road in Sao Bras de Alportel probably wasn't one of smartest moves - no water and in silly shoes. Louie Castle - rebuilt in 13th century has a nice archaeological museum and nice view to. The Katherine arrived in time for our last night in Lagos - so we booked into the fabulous tapas bar in the boat yard. Yes seriously this has to be one of the best restaurants in Lagos and it's under the chandlers with a view of the boat yard. Jim & Kathy had flown in from Texas to join the Katherine for a couple of weeks and we had a brilliant night that started with all sorts of gin and ended with Mondrango liquor! We got the pump installed but it still wasn't working right so an accumulator tank was promptly shipped. The air-con unit arrived but the engineer had to go off to a funeral so we decided to leave the marina and sail down the Algarve with James. We did have one night at anchor in Lagos bay and then sailed east. The plan was to anchor a little further down the coast but the wind ended up being far stronger than forecast and westerly creating fairly big seas. 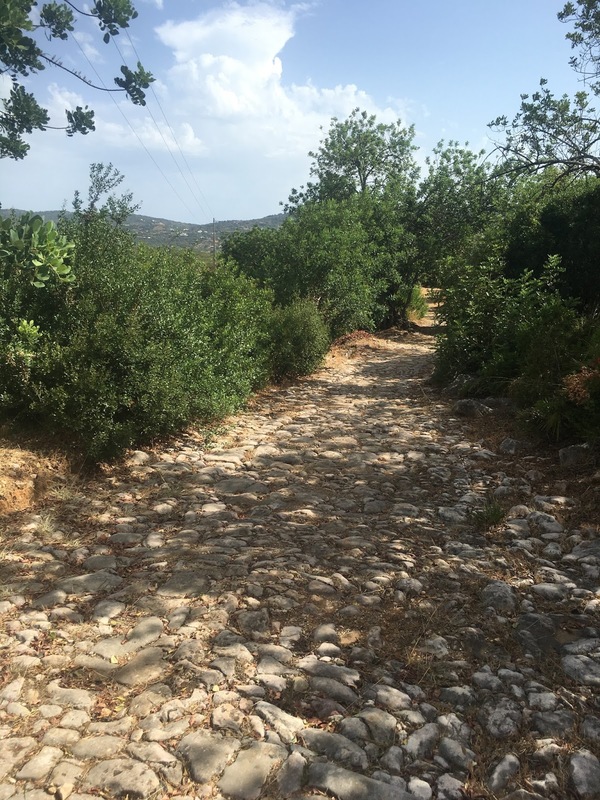 So we didn't really have much choice but to go directly to Faro. By the time we arrived at the entrance to the lagoon it was blowing nearly 30 knots and the seas were >2m so it was with some caution, locked hatches and life jackets on that we entered the pass at mid ebb (tide was running out at 4 knots). It was only a short distance and we could have opted to run off and wait in the lee of the breakwater but Askari managed to make 3 knots through the worse of it and that flat water was calling us. A little bit exciting and then total happiness to arrive in the gorgeous flat calm Ria Formosa. We anchored out in the middle of the lagoon with a view of Isla Deserta and not another boat for miles.